BS in Professional Management, Nova University, Fort Lauderdale, FL. Philippi used to work as a BellSouth design engineer and as an aircraft technician in the U.S. Navy. She embraced her dream of teaching, beginning as a 6th grade science teacher at McNair Middle School in DeKalb County. There, her 6th grade students were part of the launch that kicked off the opening of the Challenger Center. Philippi joined the staff of Fernbank Science Center in January, 2004. As part of the instructional team, she teaches various courses including Cell Biology, Forensic Science, and human development classes. She also co-manages the SEMAA program. Her first experience at Fernbank Science Center was as a 2002 GIFT (Georgia Industrial Fellowships for Teachers) recipient. It was then that Ms. Snow experienced teaching in SEMAA, NASA’s Science, Engineering, and Mathematics Aeronautics Academy program. Hoping to inspire more girls to pursue fields in science, Ms. Snow helped design curricula for, and taught in, the Sally Ride Summer Science Camp for Girls for three years at Agnes Scott College. 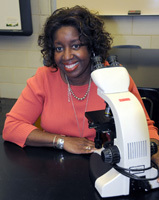 In 2003, she was selected as McNair Middle School’s Teacher of the Year. Philippi wants to be a source of support for classroom teachers. To that end, she is a Teacher Leader Endorsement candidate, part of DCSS’s first such class offered through its Professional Learning Department.